Forming new habits is the holy grail of productivity. The X-Cards Technique can help you with the process of building new habits. They studied 96 people for 12 weeks, and found that it takes 66 days on average to build a habit. Let’s just call it two months before the new behavior becomes automatic. Let’s be real there’s no guarantee that you’ll have to magical nirvana moment on day 66, but it’s a good benchmark. What will probably happen after two months is the task will have become the new normal and you won’t even notice a difference. Which is the point of a habit. One way to measure your progress while trying to build habits is by using the X-card technique. It’s really similar to the “Seinfeld Strategy”, named after comedian Jerry Seinfeld who wrote one joke a day—every day—to hone his craft. That’s pretty solid advice, but for some reason it just didn’t work for me. Let me clarify. I’ve had a few long habit building runs. Like 90 days of daily coding in a row and 113 days of meditation in a row, but for some reason they never stuck. Personally a big hinderance was trying to track on a calendar. I’ve found that when looking at a calendar I’m pulled to start new things on Sunday / Monday or at the beginning of the month. That’s a problem if motivation hits Wednesday morning. Portability was also a pain it’s impractical to take a big wall calendar around with you while you travel. I know, I know you’re probably just thinking that I’m pulling hairs here. Building a habit is hard enough on its own. If there’s anything you can do to remove friction from the process while still keeping the benefits you should consider it. The method of recording is the main difference between the Seinfeld Strategy and the X-Cards Technique. That’s why I was excited when I heard about this alternative technique. You don’t need a calendar you can use any piece of paper and a pen. Recommended tools: Get a pack of 4×6 index cards, a pencil, and a big marker. Take an index card are a small piece of paper and turn it portrait. On the bottom half draw a 7×7 grid of 49 boxes (six vertical lines intersecting six horizontal lines). On the top half of the card write the habit to build. On the back of the card write down why you’re creating / breaking this habit. When you finish the daily habit mark one of the boxes with a big X. The 49 squares represent each day so the full card is seven weeks. Very close to the two months needed to form a new habit. If you want to try to build multiple habits at once just create a new card for each. I would recommend starting off with just one “X-Card”, but that’s just me. By the time you are done with all the boxes you’d have formed a habit. But here’s the catch: you need to keep the streak alive. Daily action is the goal. That’s every single day. Whenever you need a little extra motivation, remind yourself that missing an X means your streak is busted. If you do happen to miss a day don’t beat yourself up about it. You miss one day but the very next day will have an X. If you’re reading this you’re the type of person who doesn’t give up. This means that your cards going to have an empty box between two X’s. Write down the reason why you missed a X on the back of the card, that way you’ll have a reminder of what to avoid in the future. If you don’t like empty holes in your card just start another. Today is day one. For example, researching good jokes each day is simple, but you’re never going to write a joke by merely researching. That’s why the process of writing a joke is better. 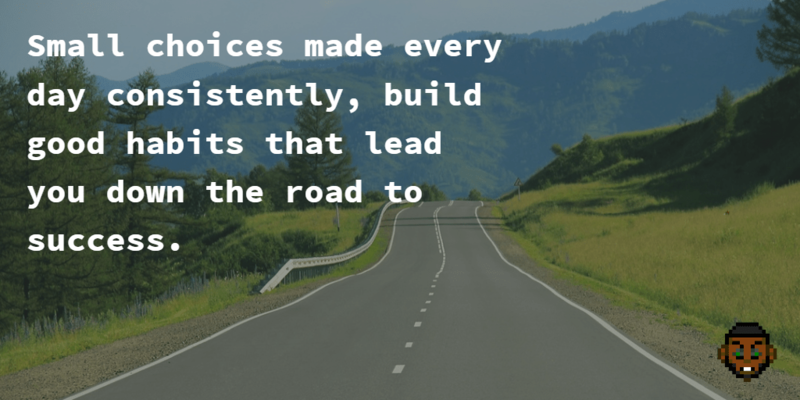 Even done in small chunks, writing can actually make a meaningful result. Do NOT make it too hard. Succeeding at 375 words a day is a lot better than failing 50% of attempted of 2,000 words a day. That’s about half a page typed single space rather than four. Once you’ve got a full card finished you can always turn it up a notch. Remember we’re going for consistent reps. It’s a binary daily achievement either you get a one or a zero. It’s similar to the Seinfeld Strategy, but better for someone who was having the same problems I was with it. Yes the X-Card Technique is just a chains trick you can gamify, but it works. You could use a calendar instead, but X-Cards are more streamlined. Sunday doesn’t have to be the left column. Today is the left column! Make up your mind now. 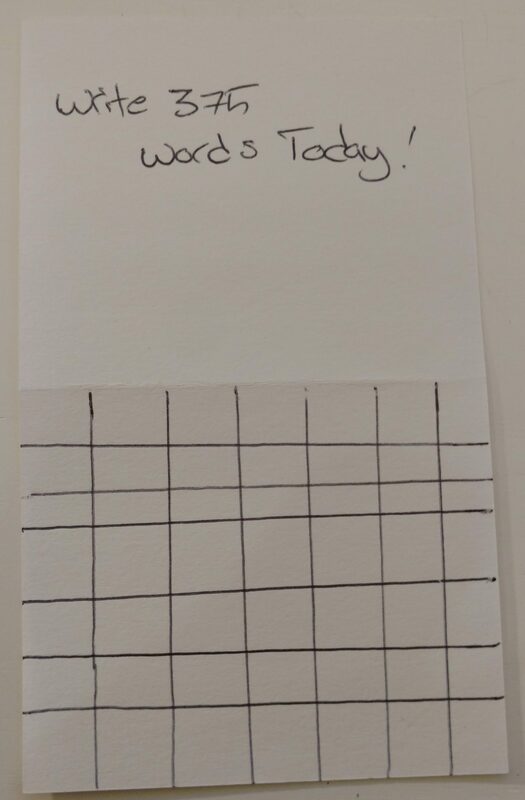 Your reason for doing this (written on the back of the card) has nothing to do with which day of the week it is. Building new habits can be tough, but the X-Cards Technique can help. Don’t break the chain. So who’s down to try the X-Card Technique with me? Let me know in the comments below. I’m doing this starting today! Writing. Meditating. Coding. Thanks for the tracking technique. How can you apply this to programming/software? I mean I don’t feel “375 words a day” can translate so great to programming.. having a hard time figuring that out. It can be a difficult translation. Something like “1 code commit a day” or “2 coding puzzles attempted a day” might work. Time boxing could be another option, “30 minutes of programming a day” for example.